Jim McGaw wins the award for easiest to work with. 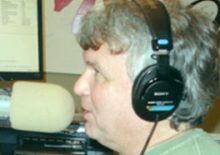 A master with the microphone and knowledge of music built over 30 years in radio, Jim held down the drive time spot on Magic 98.9 in Madison for years. People often say "I know that voice!" Jim has a warm personality, a heart of gold and loves giving more then receiving, so you'll always get more then expected with Jim McGaw. Jim will keep your dance floor jumping and you'll always know what's coming up next. It was something I've wanted to do since I was a little kid. Bill Vancil gave me my break in radio. I learned how to mobile after spending three years helping a legendary DJ named Clyde Coffee. I grew up in Madison (Fitchburg, technically) and went to Oregon High School. My family is huge. We started out with 12 and lost a few. My mom and dad are gone, too. I miss them all everyday. Good people. I'm crazy about them. Funny, honest and very kind. They made a bunch of great nieces and nephews along the way. First radio station I worked for was WGTD in Kenosha. My year of Magic 98 debut was 1987. Vilas County, WI. I also liked Mexico a lot, too, when Magic sent me there. My gray hair. I hate it but the guys in my family seem to get it at a very early age. I really hated it once when a guy at a bar called me "Pops." I paid ahead like three payments on my student loan.